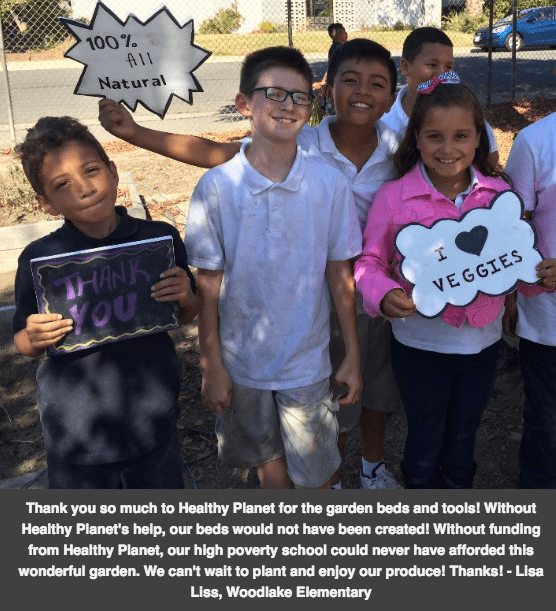 Healthy Planet US awarded Lisa Liss and Woodlake elementary a $1000 grant for their Healthy Growing school garden program. Teacher Lisa Liss led Woodlake Elementary, and her community to vote throughout an online 21 Day Recipe Challenge held by Healthy Planet US during the month of May, bringing community members together with over 834 votes for their classroom peach salsa entry. Back in fall of 2014, Woodlake successfully raised $4,700 for their Healthy Growing program that made breaking ground on a new and improved school garden and Dig Day possible. Healthy Planet’s community-based model connects schools with the local community. This model brings the whole community together while empowering everyone involved, ensuring long-term success and sustainability. Healthy Planet has helped long-term success take off with Woodlake’s Healthy Growing School Garden thanks to teacher Lisa Liss and community members. Lisa has taught her classroom skills in entrepreneurship, garden therapy, science, math, teamwork and communication all through their school garden. A success that her classroom brings to the community is through their classroom peach salsa recipe. Woodlake’s 5th-grade class makes peach salsa every school year. Lisa’s class then donates their salsa to Wind Youth and Mustard Seed School in Sacramento to help underprivileged youth. Healthy Planet US’ founder, Bryan Jersky, was raised in Sacramento and feels passionate about the children in his hometown learning to grow and eat vegetables. “Growing up with a mom who was a teacher in Sacramento instilled in me the drive to help our local communities. Since obesity is such a devastating epidemic, we want to help kids at the beginning of their journey, by planting gardens in all of the local Sacramento schools,” said Jersky.